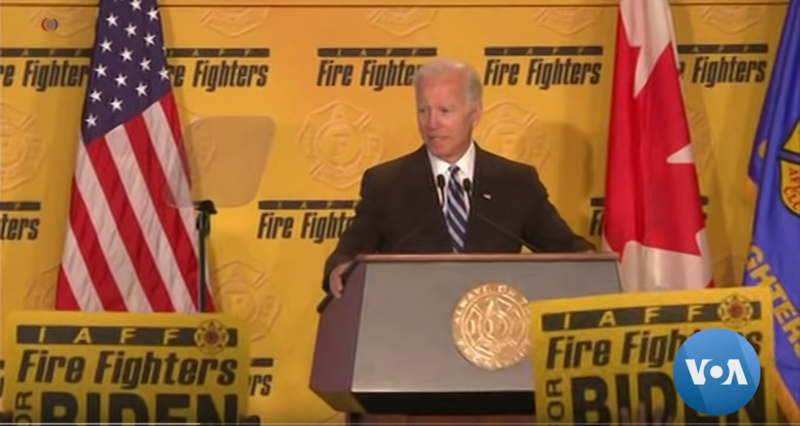 If you’re not a first responder, or you don’t know someone addicted to opioids, you may not have heard of naloxone, or Narcan. It’s a drug that saves lives in the event of a drug overdose. Evzio, a type of Narcan manufactured by Kaléo, is an injectable drug that anyone can use, including non-medical first responders, or opioid users themselves. In 2014, Kaléo for approval to sell the drug. The first version of Evzio cost $690 for a Twin Pack. Then Kaléo got together with the Clinton Foundation and many other well-respected organizations and individuals. Two years later, the Evzio Twin Pack costs $4,500 and, the the price is rising. Who pays for this? Addicts? Opioid users? Most of the buyers of Evzio are local governments, especially cities and counties – or nonprofit organizations that work with people who misuse substances. 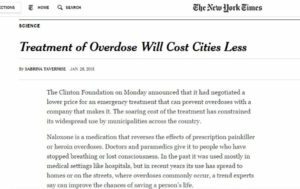 I can’t write about something I don’t understand well, so I left the drug-related Clinton Foundation/CHAI information out of most of the articles I wrote. But then, the Epi-Pen price gouging controversy focused attention on the spiraling cost of emergency, life-saving drug prices. Epi-Pen manufacturer Mylan, now facing a racketeering suit, is led by West Virginia Senator Joe Manchin’s daughter, Heather Bresch. Mylan, seemingly by coincidence, is the only U.S.-connected pharmaceutical company participating in the Clinton Foundation-associated nonprofit CHAI AIDS network. The other three CHAI AIDS drug companies are Ciplo, Hetero and Aurobindo, all generic drug manufacturers based in India. Now, I understand that the marketing and business development process followed by the Clinton Foundation/CHAI with HIV/AIDS drugs in Africa, Mylan with Epi-Pen here in the U.S., and Kaléo with its auto-injectable form of Narcan (Evzio) isn’t isolated or unique. It is the end result of multi-year, planned, product launches, P.R. pushes, as well as government official and media complicity. The customer who pays is essentially the taxpayer, whether local, state, or federal. The product’s need or efficacy has little or no relationship to the price, which is “what the market will bear” in today’s end-stage capitalism environment. In other words, as much as can be cheated, stolen or demanded. Kaléo went from tiny startup to big player in a ghoulish, profiteering end-game, after years of opioid overprescription and the re-introduction of heroin and similar drugs into our communities. The Clinton Global Initiative and the Clinton Foundation “worked with” Kaléo and similar companies to apply principles of closed market systems, twisting marketing and product development out of all recognition, and facilitating theft of public funds to benefit private companies. In this case, they, and their complicit allies in media and government, set the stage for Kaléo to make a fortune off a life-saving drug that in a healthier world, wouldn’t need to be used in the first place. Do you want to make a fortune in pharmaceuticals , maybe even ones associated with a controversial social health problem? Step 1: Raise Awareness and do P.R. The problem with opioids and health is: they’re shameful and unsavory in most people’s view. That’s a long-time prejudice. It keeps people from seeking treatment and makes these diseases much worse. The majority of people who take opioids do so because they’ve suffered an injury or illness, and a physician prescribed these grossly addictive substances. However, the stereotype among many people is that opioid addicts are messed-up junkies nodding off on filthy mattresses in abandoned, graffiti-covered warehouses. 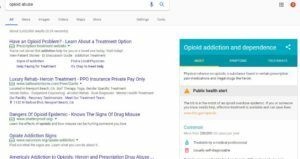 The U.S. government has issued a public health alert for opioid addiction and dependence. According to the“official” Google public health alert, this problem affects 200,000 Americans a year. To compare this dire-sounding “official alert” to other health-threatening conditions, take heart disease. According to the American Heart Association, this condition affects one in three, or more than 91 million Americans. The official Google Public Health response for “childhood obesity” states that 3 million children are affected, but there is no current “public health alert” warning. As for lung disease (which is not, necessarily, caused by cigarette smoking), in California alone, the American Lung Association estimates that nearly 4 million Californians are affected by this sickness, including about 650,000 children and 2.3 million adults with asthma. Chronic Obstructive Pulmonary Disease, which is a progressive and often deadly lung disease, has 1.2 million diagnosed. Then, there is lung cancer, with a measly 17,000 Californians diagnosed in 2016, which rounds out the list. There is no “public health alert” for lung diseases. 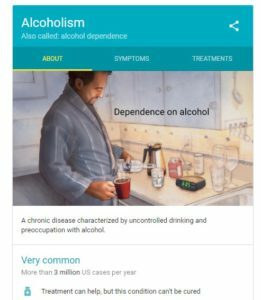 And, rather humorously (or not) “alcohol abuse” is “alcoholism” in Google. It, too, lacks a “public health alert,” but it does have a helpful illustration. Much as the Kardashians sell clothing and make up, politicians can get the word out about the dangers of opioid addiction and the need for emergency overdose medication. 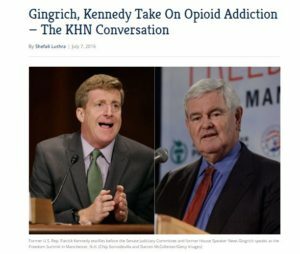 Last year, when I saw former U.S. House Speaker, Newt Gingrich and former U.S. Representative, Patrick Kennedy, together, on television, talking about the opioid epidemic, and a wonder drug that could combat the epidemic, these “subject matter experts” inspired a slightly different reaction than the intended one. These two odd “friends” inspired suspicion, not interest or trust. 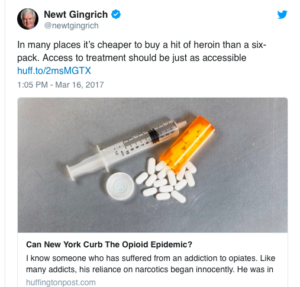 Newt has been hammering on opioids for a while and isn’t letting up. Back in January 2015, Kaléo C.E.O. 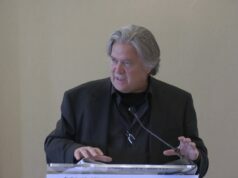 Spencer Williamson delivered a similar, stirring message to the Clinton Health Matters Summit in Indian Wells, California. According to the Clinton Foundation, the event “reached” 22 million people via social media. As noted previously in Clinton Foundation articles, all of the Clinton Foundation US-based “health initiatives” occur in localities where Bill Clinton golfs. 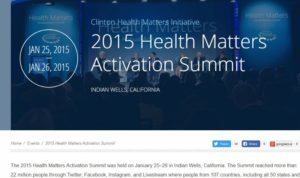 In this case, the “Health Matters Summit” coincided with the late January timing of the former Bob Hope Desert Golf Classic, now called the Career Builder Classic. But in 2015, the P.GA. 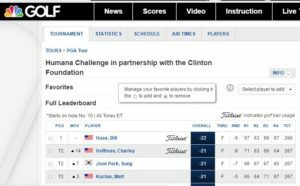 tourney was still sponsored by Humana, and another organization with a familiar name. 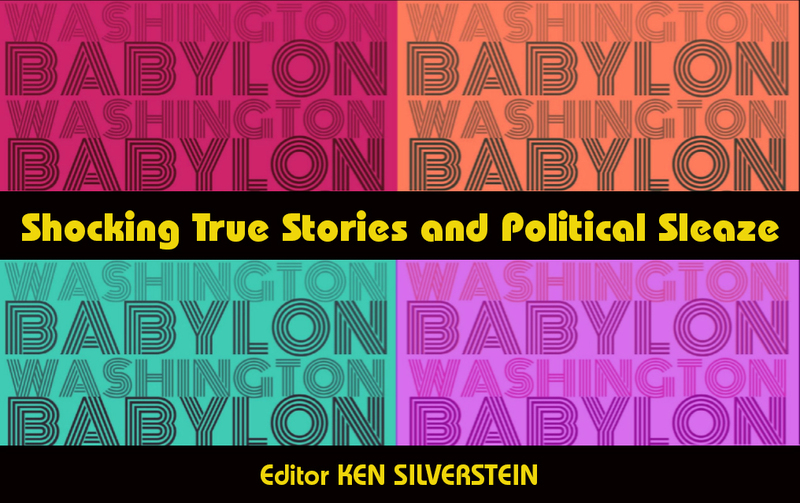 Reliable print journalism sources aid in informing the public of serious public health crises. What a relief to know these drugs are available: thanks NY Times and Mother Jones! 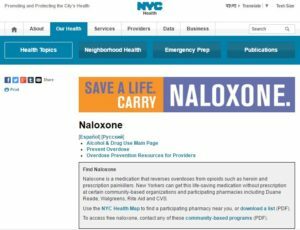 Just like in New York City: they give Evzio packages away free to people at risk of drug overdoses. But it’s not free to New York City taxpayers. How many government agencies or nonprofits have received the Kaléo Narcan self-injecting dose packages now sold for $4,500? This backroom scheme enriches Kaléo, its ownership, and other members of the “public-private partnership.” Still privately-held, Kaléo is now being featured in select business publications with rumors of a potential Initial Public Offering. If you take only one thing from this article, remember that the Kaléo/Clinton health partnership didn’t benefit anyone’s health. It just benefited the health of the investments and bank accounts of the principals of the pharma company and assorted public figures. If you like this story, please share it on Twitter, Facebook, LinkedIn, your blog. Consider buying something I’ve written that is for sale. Give support for future articles. Email or follow me on Twitter. Previous articleGet Smart: WTF Happened in Brazil, Coup or Impeachment? 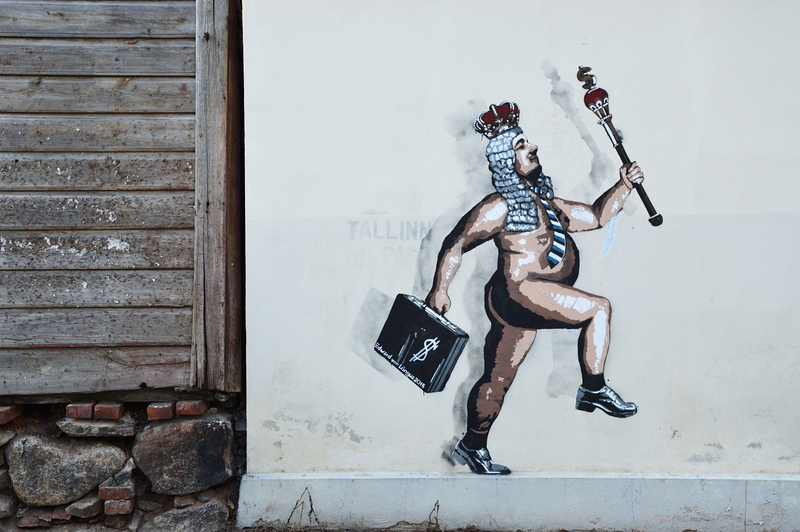 Internet Censorship And How To Fight It With Publisher Lawsuits!